When looking for green dinnerware, you will find that various shades of green are available. From glass dinnerware sets to amazing pattern dinnerware, I'm sure that you will find exactly what you are looking for. Green is a popular color for home décor, today as well as in previous years. Therefore, you can find dinnerware options in both patterned and solid-colored dinnerware and in current, vintage and antique dinnerware. The shades range from light green to forest green and even include bright neon colors for a trendy look or camouflage or sage green for a outdoorsy style of decor. I love the rustic colors that are used in modern décor that feature dark green as part of the color scheme. That definitely fits into my décor style but the green is more of complementary color, rather than the theme color. I also have several green glass dinnerware pieces. Some are depression glass which is definitely beautiful. I usually use my green glassware and pink glassware around the Easter season because of the pastel colors. Green patterns are plentiful in the dinnerware category. There are various shades and styles to choose from. 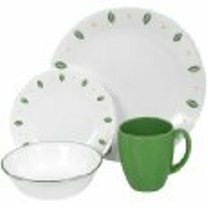 A popular dinnerware choice in modern dinnerware include Rachael Ray dinnerware, which features several patterns with various shades of green. Fiesta dinnerware is a good choice if you are looking for solid colored dinnerware. Currently both the Shamrock and Lemongrass colors are in production. American Atelier offers some awesome patterns that feature green along with Corelle dinnerware, Gibson dinnerware, Casafina dinnerware and Home Trends dinnerware. 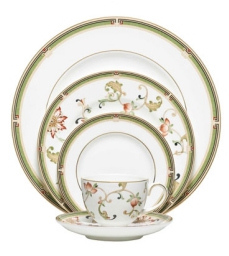 Pfaltzgraff dinnerware offers several patterns with green in them and they are excellent choice for colorful dinnerware patterns. 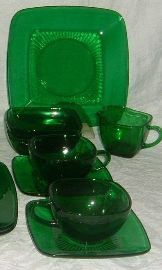 Glass dinnerware sets can be found in green glassware as well. These include modern productions along with vintage and antique patterns. I love using green glassware. Most of my pieces are a very light green, but I also find the dark green versions to be appealing. Of course there are collectible glassware versions in green. Depression glass and Fire King Jadeite are probably the most sought out amongst collectors. If you like colorful dinnerware and green dinnerware is your choice, there are really a lot of styles and shades to choose from. The best to you in finding exactly what you need to complete your decor with an awesome dinnerware set and serveware.